top 5 of all time well known regardless of growing up in church or not. This morning we’re going to look at one of the more well-known parables, it may be the in the top 5 of all time well known regardless of growing up in church or not. So when you pray, you should pray like this:‘Our Father in heaven,may your name always be kept holy. May your kingdom comeand what you want be done,here on earth as it is in heaven. You will be done on earth as it is in Heaven. When you and I gave our lives to Christ and our spirit was made new, we also signed up to the process of our mind being transformed. The first step in that journey is to agree and subject our lives to the authority of God’s Word. A relationship with God happens through His word. So, over the next few weeks, I want us to look at some of the teachings and parables that Jesus spoke to give us insight on how to live here on earth while filtering our lives with a Heaven mindset. Are you ready to reprioritize your values? Are you focused on the Kingdom? Lawyer, a teacher of the law. These men were respected in their communities and usually at the top of social standing. Teacher….Only called a person that if you believed they could do just that. Testing… He has an agenda. establish rules to keep the law. This was a common understanding back then. In fact, a similar conversation is had in Mark 12:28 a scribe comes to Jesus and asks him what’s the greatest commandment. So this Lawyer answers the same and Jesus then sets up get to the heart of his issue. Let’s read on. And He said to him, “You have answered rightly; do this and you will live.” But he, wanting to justify himself, said to Jesus, “And who is my neighbor?” Then Jesus answered and said: “A certain man went down from Jerusalem to Jericho, and fell among thieves, who stripped him of his clothing, wounded him, and departed, leaving him half dead. There were two camps of thought developing around this question. The first camp of Jews believed only fellow Jews. The more liberal Jews believed fellow Jews and also those converted to Judaism and while there was disagreement about who was a neighbor they all agreed that gentiles were NOT. It’s also worth noting that you were not bound by law to help someone that was not your neighbor and so understanding at the time was, people outside their group: were not their neighbor. Jesus reduces the identity of this person to just a human being. Now by chance a certain priest came down that road. And when he saw him, he passed by on the other side. 32 Likewise a Levite, when he arrived at the place, came and looked, and passed by on the other side. Historically this is where we bash the priest. We can’t believe a minister wouldn’t help him and often believers today who withdraw from church gatherings and with church leaders flashback to this scripture as a point of validation. We should not fall into that trap. There is much moring going on in the culture at this time than meets the eye. It was common that the priest was on a 2-week rotation and expected to perform their sacrificial duties. Priest, as well as Levites and Jewish laymen, made up what was called, The Delegation of Israel. As a Priest, you had to be “clean” and in the written Tora: Not to touch a corpse–stay away several yards. It would be a mark of shame/Gong/ and banned to the Eastern Gate if unclean. To become clean it was a 7-day process, You’d have to purchase a heifer, not partake in food from the sacrifice and this would also affect your family. This priest was counting the cost. Likewise, a Levite, when he arrived at the place, came and looked, and passed by on the other side. 33 But a certain Samaritan, as he journeyed, came where he was. And when he saw him, he had compassion. Notice the words here, with Priest passed on the other side but the Levite.. arrived at the place. He got a little closer. The Levite, not bound by the same rules goes near, still not touching but also faced with a dilemma. They are working it out in their minds as to where this is going. Remember in Biblical day the Priest was the authority. They made rulings for the people. He represented God. There was not a personal relationship with God that you could have. It happened through the Priest. So it’s likely this Levite sees up ahead the Priest and sees the ruling, so who is he to go above, around what was already decided a few moments ago. So he too passes by. When you choose compassion it will come with great risk. It’s worth noting that this Samaritan is still at great risk in bringing this man to a place where they hated Samaritans. It’d very much be like a picture in the old west where a Native American sees a wounded cowboy and brings him to town for help and the people shoot at him thinking he’s a danger or even the one who harmed the cowboy. Let’s get to the two questions that the lawyer asked and pull out the single point I want us to understand this morning. 1.) What must I do to inherit eternal life? Answer: You can’t DO anything. The gospel is about living in the acceptance of what Christ did. 2.) Who is my neighbor? Answer: Mankind, specifically–The people you don’t like or agree with. If we aim at everything, we hit nothing. I’m not voiding that we are to love all, I’m suggesting when it comes to your personal, everyday spiritual journey that you begin with those closest to you. The man married 50 years/ The man who committed adultery. The man in a suit/ the man in a dress. The woman waiting for a spouse/the woman shacking up with her lover. The teen in church/ the teen agnostic. Jesus has commanded every single one of us to “Go and do likewise,” I’d like for us to begin this year with a new thought about outreach for 2019-2020 What if….instead of big events this year (and I love big events!) 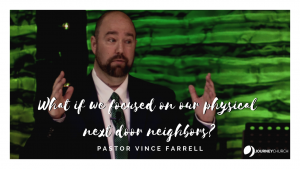 What if we focused on our physical next door neighbors? To grasp the full vision our Elders and Staff have been reading and infusing this book into our hearts as we really look close on how we can be a catalyst for city transformation. We encourage you to join us. The link The Art of Neighboring has the greatest deal on the book and if you show this to LifeWay they will match the price.